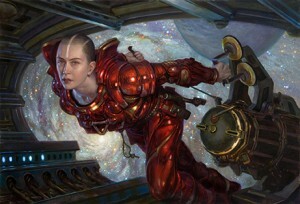 Donato Giancola, The Mechanical, 2015. 20″ x 30″ oil on panel. ©Donato Ginacola. All rights reserved. Stockbridge, MA, March 19, 2018—As part of its Picturing The Fantastical series, Norman Rockwell Museum will present an evening lecture with illustrator Donato Giancola on Saturday, April 14, from 5 to 7 p.m. A renowned painter of fantasy themes, Giancola balances modern concepts with realism in his paintings to bridge the worlds of contemporary and historical figurative arts—from J.R.R. Tolkien’s The Lord of the Rings to Botticellis’ La Primavera. Known for his work for the Magic: The Gathering card game, the artist will discuss the background, education, and milestones that have advanced his fan-to-professional career, and offer observations about life as an in-demand working illustrator today. The event is free for Museum members, children 18 and under, or with regular Museum admission. Saturday, April 14, and May 12, 1 to 4 p.m.
Take on the avatar of a heroic, fantastical figure and explore far-off lands with Dungeon Master Cliff Hanson during these special Dungeons & Dragons game days. Free for Museum members, or included with Museum admission. Children free to age 18. For children 12 and up.